Railpictures.ca - Rob Smith Photo: RLHH 598 made a rare Monday appearance on the Burford Spur with an even rarer three-unit lash-up. They went down to Ingenia with 10 cars and returned with 3. The return trip was right at the beginning of rush hour, and I was probably the only driver on Clarence Street that didn’t mind the delay. It was miraculous that I managed to get a gap in traffic big enough to get a car-free photo. 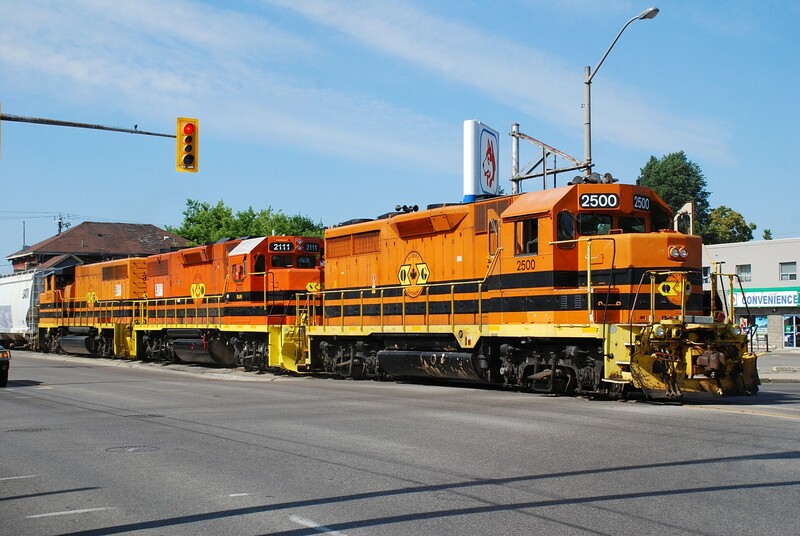 QGRY 2500 probably returned to Hamilton light, whereas RLHH 2111 and 3049 were most likely left in Brantford for RLHH 595 to take to Nanticoke tonight. | Railpictures.ca – Canadian Railway Photography – photographie ferroviaire Canadienne. Caption: RLHH 598 made a rare Monday appearance on the Burford Spur with an even rarer three-unit lash-up. They went down to Ingenia with 10 cars and returned with 3. The return trip was right at the beginning of rush hour, and I was probably the only driver on Clarence Street that didn't mind the delay. It was miraculous that I managed to get a gap in traffic big enough to get a car-free photo. QGRY 2500 probably returned to Hamilton light, whereas RLHH 2111 and 3049 were most likely left in Brantford for RLHH 595 to take to Nanticoke tonight. I wondered if that trackage could support that sort of tonnage…however the classic Burford shot as from Mr Mooney.. triple axel SD40-2! So yes it does!! That would have been a great 597 to photograph last night! Thanks Jason. Aaron, to be honest I didn’t notice if the railway crossing signals were working but I can tell you that they are synchronised with the traffic signals. IF one ain’t workin’ the other one ain’t workin’! The SOR ponies have been reassigned this day … RLHH 3404, QGRY 6908 & RLHH 3049 perform switching duties at Garnet Yard, Franklin and Stelco lead plus 597/595 turn … QGRY 2500 is now working the north end Esso Refinery while QGRY 2301 services the south end of the refinery. Perhaps only 3049 was set off. Thanks Glenn. Nice catch guys … 4 horse hitch resting in yard at Garnet this morning albeit no RLHH 2111 (Hamilton bound? ).